Hey, does this make you think of a summer lunch at the beach? Nope, me neither. It looks more like a neglected trophy of when some giant race of interstellar shellfish came gunning for the human race and we kicked the living bejeezus out of them. Grandpa told me about it when I was five – and that’s one of the invaders mounted there to remind us all of what happened in 1991. Australia’s love affair with big things is well documented. We have unconvincing over-sized fibreglass pineapples, koalas, potatoes, sheep and more adorning highways across the country. Earlier this year, chicken chain Nando’s created a publicity stunt by ‘stealing’ the Big Mango at Bowen in North Queensland, and then stashing it in the bushes in a nearby paddock. A local wag even posted an ad on Gumtree offering to trade it for The Big Banana from Coffs Habour. But of course, just because it’s big doesn’t mean it’s good. Back in 2009 The Big Prawn was looking distinctly faded and unappetizing (left). But when the owner refused to shell out for a refurbishment and proposed tearing it down, even the local Mayor struggled to choose between the words ‘icon’ and ‘eyesore’ – and then the rumours started that it would be replaced with a giant pelican. I could talk wistfully of the many times I stopped at the Big Prawn for a game of air hockey, while waiting for a coffee that tasted ever so slightly of seafood. But that could get quite strange quite fast. 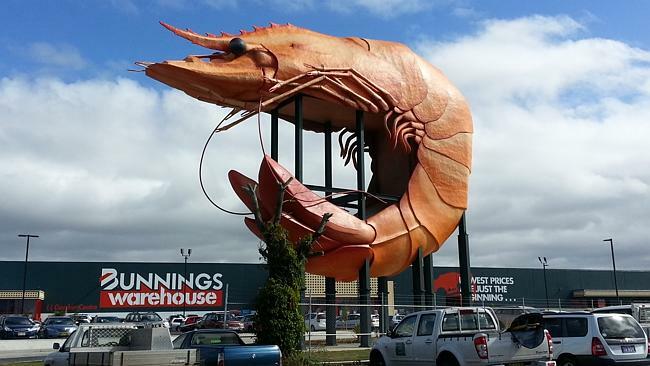 These days the service station and tourist complex are gone, but the Big Prawn recently enjoyed a $400,000 touch up and sold this month for an impressive $21.3 million – with a Bunnings Warehouse thrown in for good measure. 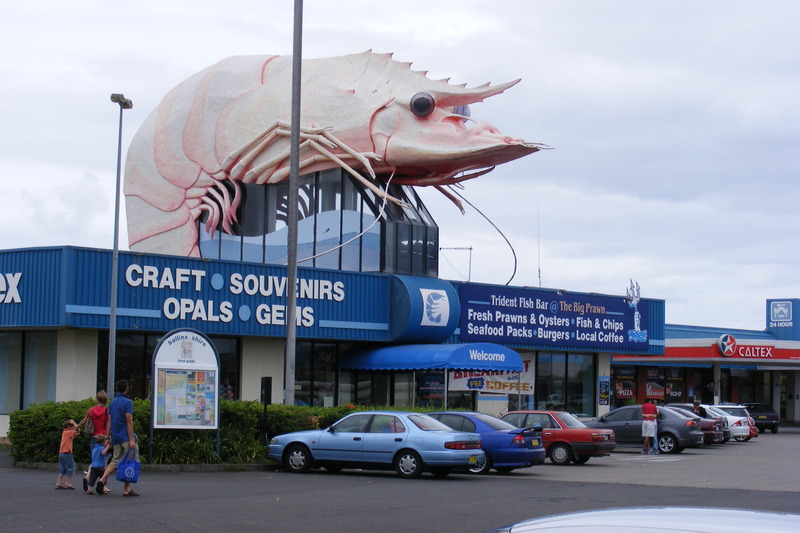 Apparently the chronic lack of premium-grade, retail investment properties featuring super-sized crustaceans attracted some cashed up, giant seafood aficionados. Pass the giant lemon wedge.